Are you loving Almond Butter? Are you making AB & J sandwiches? Or AB & B (banana) sandwiches? I tend to be the ‘grind your own AB’ person at Whole Foods, but I know many companies also sell it jarred. If you haven’t tried it yet…buy some today! I attempted one time to make my own Maple Cinnamon Almond Butter and it was AMAZING! Some of the best I’ve ever tasted. So when I had some left over raw almonds, I knew I wanted to turn them into another fun almond butter. This time, I went for the Chocolate Chip Cookie Dough Almond Butter from The Edible Perspectives. Want to make your own almond butter? 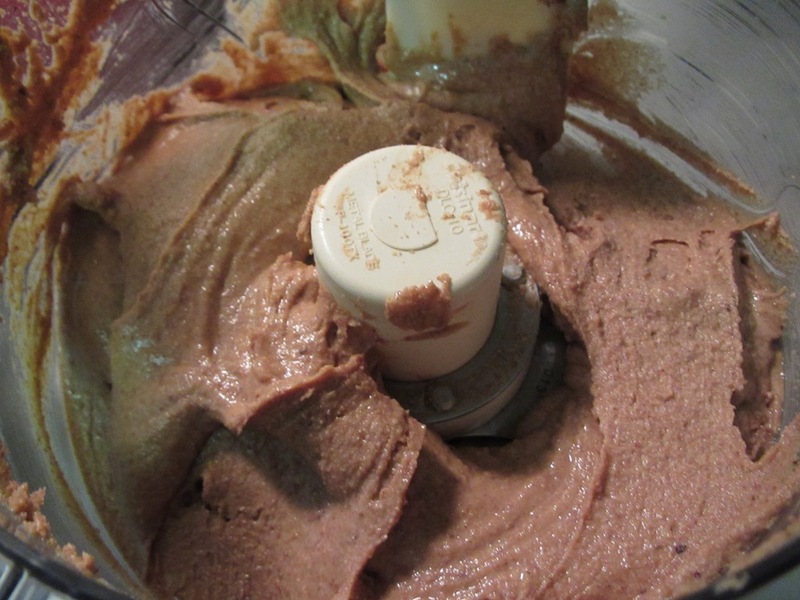 It is super easy…just pour yourself a glass of wine and let your food processor do the work! 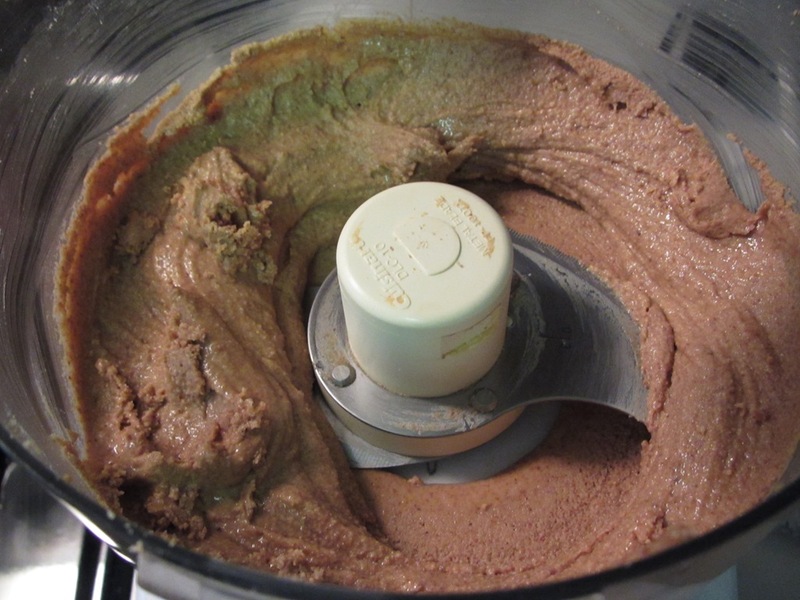 I used ~2 cups of toasted almonds in the processor and got this basic almond butter. This tastes fabulous on its own, but even better with some extras. I added the sugar, salt, vanilla, and almond extract. I didn’t add oil for this smooth consistency, but I had some safflower oil on hand in case I needed it. The author mentioned that adding chocolate chips immediately would cause the chips to melt…which got me thinking…chocolate almond butter…yum! I pulled out a few spoonfuls of AB and added some dark chocolate chips. They melted quickly creating the most amazing dark chocolate almond butter EVER!!! I put the remaining mixture in the fridge for ~30 minutes before stirring in some mini chocolate chips. I was happy to find a leftover jar from my Door County goodies. I don’t know how all of these bloggers get these beautiful looking AB pictures. This stuff is sticky and tough to fit into a jar. The AB is not too sweet and goes well with toast, bananas, graham crackers, oats and whatever else you can think of! My jar of homemade almond butter (and the dark chocolate AB that didn’t last long before it was eaten) found a home in the pantry with some of my other nut butters. With both of these tasty new flavors, what’s not to love??? ← What did I do with CSA Week 8? Thanks! It is pretty addicting! You’ve inspired me to make my own fun flavors of AB and the wine is essential during the “patient” part of the process. Plus, it helps with the tastings…I know you said they are encouraged! I was just perusing your recipes! This looks awesome!! I might just make it….SOON! !